Play the Matrix-Q Series 729 Game of the 9 Economies! Win 300.00,00 Sun [x] Tokens in Prizes! Matrix-Q DNA Algorithms training for participants included. 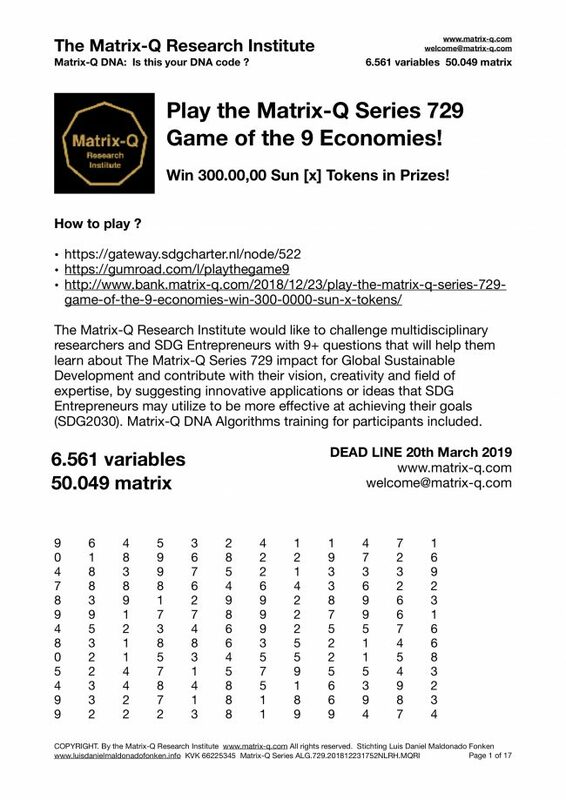 The Matrix-Q Research Institute would like to challenge multidisciplinary researchers and SDG Entrepreneurs with 9+ questions that will help them learn about The Matrix-Q Series 729 impact for Global Sustainable Development and contribute with their vision, creativity and field of expertise, by suggesting innovative applications or ideas that SDG Entrepreneurs may utilize to be more effective at achieving their goals (SDG2030).